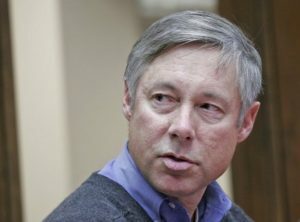 Progressive news website Nation of Change reports that District 6 U.S. Rep. Fred Upton, R-Michigan, is pushing for rapid approval of a measure to expedite exports to Puerto Rico of liquefied natural gas — an industry that has given him hundreds of thousands of dollars in donation and in which he, in turn, has tens of thousands of dollars in investments. Read the story (link below) and join us in November to send a Democrat to Washington who represents the people of our district, not his own self-interest. Also at the Subcommittee on Energy hearing last week, Chairman and U.S. Rep. Fred Upton (R-MI) said that expediting permitting for small-scale LNG exports was necessary because it would allow LNG to flow to Puerto Rico, whose electricity grid was destroyed by Hurricane Maria last fall and is now under repair. Upton has received over $1 million in campaign contributions from the oil and gas industry throughout his congressional career, including $10,000 from Energy Transfer Equity (a subsidiary of pipeline giant Energy Transfer Partners, owner of the Dakota Access pipeline and co-owner of the proposed Lake Charles LNG export terminal), $5,000 from Halliburton, and another $5,000 from Koch Industries for his 2018 re-election campaign. Upton has received $101,950 in campaign contributions from Energy Transfer Partners over his career in Congress. According to his 2017 financial disclosure forms, Upton has tens of thousands of dollars in investments in oil and gas companies such as ExxonMobil, Chesapeake Energy, Chevron, EOG Resources, and Schlumberger.